Borobudur Temple - How to build it ? Borobudur temple review. Borobudur was the magnificent world cultural heritage site. Temples including cultural building heritage. Cultural heritage does not belong to all nations, but that of the entire human race. Borobudur temple was must to see in semarang tours or yogyakarta tours. If you are coming from cruise we have long experiences to do semarang shore excursions for borobudur tour, see : CRUISE TOUR PACKAGES. 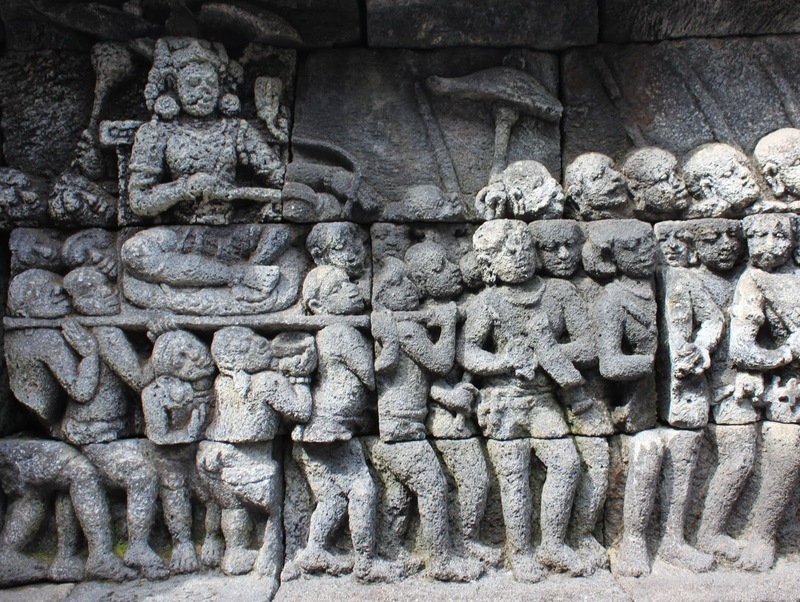 We extracted from various sources about the Borobudur to help you in understanding the work of Indonesian people that time, who already do understand management of construction and have very beautiful art. Come and visit Borobudur temple also hundred if not thousand other temples in Yogyakarta and surrounding areas (include in East Java). So, how to built Borobudur Temple in 9 Century ? The volume of primary material. The main material of this temple is high berporositas andesite with a specific gravity 1,6 - 2,0 t/m3. It is estimated there are 55,000 m3 of stone formers temple or approximately 2 million rock with rock sizes ranging from 25 x 10 x 15 cm. Weight per piece of rock about 7.5 to 10 kg. Building construction. Borobudur is a pile of rocks placed on top of a mound at its core, so it is not a massive pile of rocks. Soil core also deliberately terraces steps and the top flattened to put the rock temple. Each stone spliced ​​without using cement or adhesive. These stones are only connected by patterns and stacked. All the stones taken from the river around the Borobudur Temple. Borobudur temple is a building complex views of the parts are built. Consists of 10 levels which is square and level 1-6 the rest of the round. The temple walls are filled with pictures as much relief 1.460 panels. There are 505 statues that complement the temple. Estimated implementation time period. No information is accurate. However, some sources say that Borobudur was built starting in 824 AD - 847 AD. Construction of the temple is done gradually. Initially built storey apartment layout. It seems designed as a terraced pyramid. but later changed. As there is evidence that demolished apartment layout. The second stage Borobudur foundation widened, plus two square steps and one step directly circle given the huge main stupa. The third stage, the railroad circle with a large main stupa dismantled and removed and replaced three railroad circles. Stupas built on top of these steps with a large stupa in the centre.Fourth stage, there are minor changes, namely making relief and making changes to the ladder above the entrance arch. One thing that is unique, it turns out that this temple has interesting architecture or structured format in mathematics. each bagain legs, body and head of the temple always has a ratio of 4 : 6 : 9. 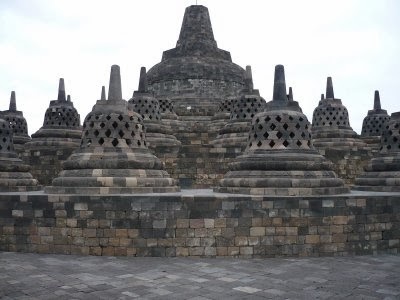 Stupa placements also has special meaning, plus the expected relief part berkatian with astronomy makes Borobudur is an interesting historical evidence for the observed. Number of stupas in Arupadhatu level (not at the summit stupa count) are: 32, 24, 26, which has a regular comparison, ie 4 : 3 : 2, and everything is divisible by 8. Height stupa at three levels of TSB. Are: 1.9 m, 1.8 m, respectively different only 10 cm. So is the diameter of the stupas, having the same exact size as well with the high: 1.9 m, 1.8 m, 1.7 m.
Some numbers in Borobudur, when added together the numbers will end up being number 1 again. Alleged that it was made ​​so that could be interpreted: the number 1 symbolizes the One the Adhi Buddha. Number of levels of Borobudur was 10, the numbers in the 10 when added together result: 1 + 0 = 1. Arupadhatu number of stupas in which there are no idols: 32 + 24 + 16 + 1 = 73, number 73 when added together result: as above 10 and 1 + 0 = 10. Number of statues in Borobudur total of 505 pieces. When the numbers in it are summed, the result is 5 + 0 + 5 = 10 and also as above 1 + 0 = 1.
stone temple size is approximately 25 x 10 x 15 cm with a weight of rock types is 1.6 to 2 ton/m3, this means the weight per piece of rock just about maximum 7.5 kg (for 2 t/m3 density). Pieces of stone was very mild. For such a heavy rock, it does not need any technology. The problem that may arise is slanted terrain that must be taken. Sloping terrain physics make the load seems to be heavier. This is due to the decomposition of force causes no horizontal load parallel slope that must be borne. But with the fact that the weight per piece of stone is only 7.5 kg, it issues a sloping terrain terraces (beundak) the steps do not matter. The conclusion is the process of transporting the stone pieces are simple and do not need any technology. Source material is taken from the river rocks around the temple. This means that the distance between the quarry and the site is very close. Although the number reached 2.000.000 pieces, but each piece of stone material severity and proximity of transport, this means the transport process can be done easily without the need for specific technologies. The temple was built in the time period long enough. Some say 23 years some say 92 years. If the fastest assume 23 years. Let us count the stone mounting about productivity. If the land preparation and early material was 2 years old, then the installation of the stone age is 21 years or 7.665 days. There are 2 million pieces of stone. Productivity stone installation is 2.000.000/7.665 = 261 stones / day. This feels very little productivity. Do not need any way to produce the small productivity. Moreover, using the data execution duration is longer. Borobudur seen physically so impressive. It has 10 floors with square and circular shapes. 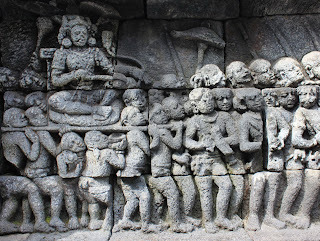 Has reliefs along the walls and statues in large numbers. The temple is so concerned philosophy contained in the measures. This proves that the temple was built with the concept of design was quite good. Borobudur temple is also seen complex views of architectural design consists of 10 levels which is square and level 1-6 the rest of the round. The temple walls are filled with pictures as much relief 1460 panels. There are 504 statues that complement the temple. This is definitely not a job that's easy to design and implementation. Borobudur temple valuable conclusions from either side of the design of civil engineering and architecture art requires careful planning and management of the design aspects and how to implement it. I concluded that this temple was built by the project management has been pretty good.